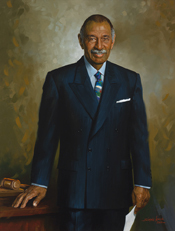 CONYERS, John, Jr., a Representative from Michigan; born in Detroit, Wayne County, Mich., May 16, 1929; attended Detroit public schools; B.A., Wayne State University, Detroit, Mich., 1957; LL.B., Wayne State Law School, Detroit, Mich., 1958; lawyer, private practice; Michigan National Guard, 1948-1950; United States Army, 1950-1954; United States Army Reserve, 1954-1957; staff, United States Representative John D. Dingell, Jr., of Michigan, 1958-1961; general counsel for three labor locals in Detroit, 1959-1964; executive board member, Detroit, Mich., American Civil Liberties Union, 1964 to present; executive board member, Detroit, Mich., NAACP, 1963 to present; referee for Michigan workmen’s compensation department, 1961-1963; elected as a Democrat to the Eighty-ninth and to the twenty-six succeeding Congresses until his resignation on December 5, 2017 (January 3, 1965-December 5, 2017); one of the managers appointed by the House of Representatives in 1988 to conduct the impeachment proceedings against Alcee Lamar Hastings, judge of the United States District Court for the Southern District of Florida; chairman, Committee on Government Operations (One Hundred First through One Hundred Third Congresses); chairman, Committee on the Judiciary (One Hundred Tenth and One Hundred Eleventh Congresses). Oral History: 2001, amount unknown. An oral history interview of John Conyers conducted on April 26, 2001. Oral History: In the National Visionary Leadership Project, 1997-2003, amount unknown. Interviewees include John Conyers, Jr. Excerpts of the interviews are available online: http://www.visionaryproject.org/nvlpmembertier/visionariest1/VisionaryPages/conyersjohn/broadband.asp. Papers: In the New Democratic Coalition of New York Records, 1960-1978, 49 cubic feet. Persons represented include John Conyers. Videocassette: 1989, 2 commercials on 1 videocassette. The commercials were used during John Conyers's campaign for the 1989 mayoral election in Detroit, Michigan, Democratic Party. Papers: 1937-1945, 1 folder. Leaflets, pamphlets, clippings relating to John Conyers's activities and services with UAW-CIO. A finding aid is available in the repository. Conyers, John, Jr. "The Patriot Myth: Caveat Emptor." Arms Control Today 22 (November 1992): 3-10. Dostal, Bonita Jean. "The Decision-Making Process of Representative John Conyers, Jr., and His Administrative Assistants." Ph. D. Diss., University of Michigan, 1972. "John Conyers, Jr." in Black Americans in Congress, 1870-2007. Prepared under the direction of the Committee on House Administration by the Office of History & Preservation, U.S. House of Representatives. Washington: Government Printing Office, 2008. Ralph Nader Congress Project. Citizens Look at Congress: John Conyers, Jr., Democratic Representative from Michigan. Washington, D. C.: Grossman Publishers, 1972.